Triggered notifications are automated notifications that go out automatically after a certain event has occurred. We automatically track several events for Shopify users (view list) but you can always add custom events (view more). In this document, we are going to show you how to add triggered notifications into your web push notifications. These notifications are triggered when a user triggers a certain event. Let’s get started. In order to send triggered notifications you will first need to make sure you are tracking some custom events on your website. As mentioned above, some of our integrations will automatically track events for you. You can see if your site is collecting any events by checking the Logs > Custom Events within your dashboard. If you need help tracking custom events, please check out our documentation on event tracking. Start off by logging into your Aimtell account and opening your dashboard. From there, click on ‘ Triggered Notifications’ located in the navigation bar on the left side of the screen. Selecting ‘Triggered Notifications’ will take you to your Campaigns page for all of your triggered campaigns. 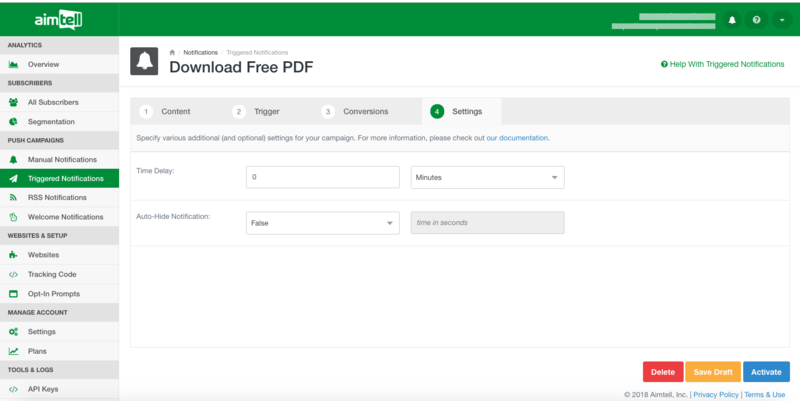 If you installed our software via one of our 3rd party plugins you may have some sample campaigns already prepared for you. For instance, Shopify users will see two campaigns - one for ‘Item Shipped’ and one for ‘Abandoned Cart.’ These are two popular examples of triggered campaigns you may wish to set up for your website. Start by selecting the ‘New Triggered Notification’ button. This will allow you to set up a new triggered campaign for particular subscriber action. Once you hit ‘Create Campaign’, enter your title, body, and destination URL based on this new campaign. In the example below, we are preparing a notification that will go out automatically to a subscriber after they download our PDF. After you set up the content for your notification, click the ‘Trigger’ tab to open the customization options for what will trigger the notification. In this case, the category is "Downloaded" and action is "Success PDF". Finally, select the ‘Delay’ tab to determine when the notification should be sent. The delay is measured in minutes, so if you want to send a notification to this visitor who downloaded the free pdf after about 10 minutes, set the number to 5. When you are finished, you may either save the campaign as a draft or activate it right away by selecting the appropriate button at the bottom of the page (you may also choose to delete the campaign if you wish). That’s it! Your new triggered notification will display along with all of your other triggered campaigns.